The Régie du logement's rent increase calculation tools require the revenue and expenses for the building. This information can be obtained from the landlord, but it is difficult for a tenant to verify. However, past amounts reported by the landlord can be calculated with rent increase decisions from the Régie. The past expenses can be used by the tenant to estimate an appropriate rent increase. Detailed instructions follow after the calculator. 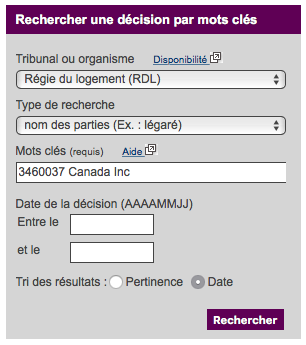 Search for decisions from the Régie through the Société québécoise d'information juridique. Filter by cases heard by the Régie du logement, and search for the legal name of the landlord. In this example I'll use a building in my neighbourhood managed by "3460037 Canada Inc."
These amounts will be converted to the amounts reported by the landlord. First, choose the date range with the first day of the renewed lease. For the example case, the first day of the renewed lease was May 1, 2014, so the period is "April 2, 2014 – April 1, 2015". The previous monthly rent of the unit was $957 (shown in the Régie's decision). The number of units in the building is optional, and shows the average rent in the building. Here there are 70 units. If this is unknown, it's usually in the city tax bill (next paragraph). Municipal and school tax amounts are needed. For this case, the calculator asks for the 2014 and 2013 municipal taxes. These are published by the city. Here's a link to the search page for municipal taxes in the city of Montréal. The example property is located in Westmount, and municipal taxes were $105,411.76 in 2014 and $102,831.99 in 2013. School taxes are usually assessed by the school board. On the Island of Montréal they are determined by the Comité de gestion de la taxe scolaire de l’île de Montréal. Using their search tool, the amounts for the example are $18,823.20 for 2013–2014 and $18,484.14 for 2012–2013. The amounts from past cases can be used to estimate the rent increase for another unit in the same building today. 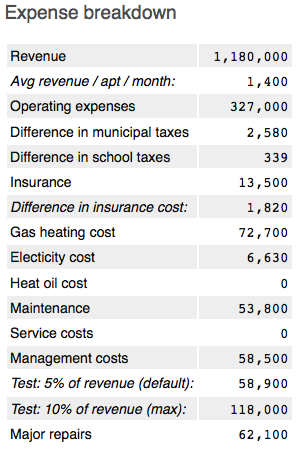 For example, Hydro Quebec publishes energy costs in Quebec by year which can be used to adjust energy prices. Taxes for the current year are known. Revenue could be expected to follow the Consumer Price Index. Calculating the amounts from cases in different years can help estimate likely increases in insurance costs, maintenance, and major repairs. My hope is that this tool can help you negotiate a fair rent increase and combat the information disadvantage that tenants in Quebec face in determining appropriate rent increases. The calculation assumes that major repairs were for the entire building and do not include any repairs that benefitted only the specific unit. Results are given to three significant figures, since the increase by category amounts from the Régie tend to be less than $10 and only have precision to the cent. The calculator uses the rates and equations provided in the "How to Agree on the Rent" documents provided annually by the Régie du logement. The equation is evaluated for various values of Revenue until the increase matches the known increase given in the decision. The calculator uses an incremental search, then the bisection method to determine this root. Similar to the previous step, this equation is evaluated for various values of Expenses until the increase matches the known increase given in the decision. In this case the bisection method is used to determine the root, with the assumption that the expenses will not be higher than several times the revenue. The previous formula calculates only the difference in insurance costs year over year, but the actual insurance amount for the previous year is determined by summing all the other operating expenses individually and subtracting them from the overall operating expenses found previously.